Windsock is an advanced weather app for professional fliers of drones and other UAVs. As a pro perhaps you've already found that packing the flight gear and driving down to the flying location only to find it's too windy to fly can be frustrating. Instead use these tools get comprehensive reports on the latest flight conditions for a near-by location so you can feel confident that it's great weather at sunset for flying or even if it's great right now - find those perfect flying weather windows and fly smarter! Multi-source 7 day forecasts provided hourly contain up to 15 different forecast metrics to help you understand conditions better. 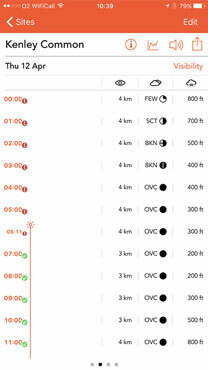 Condition tick marks appear next to weather conditions for sites that are good to fly and warnings for ones that are not! Forget throwing a bit of muddy grass in the air, for devices with a built-in compass tap on a direction and see relative wind directions. Get informed when the temperature at a location could potentially reduce the usable capacity of drone batteries. Once you're at your location just shake your device and it will read out flight conditions including how much daylight you have left as part of a comprehensive audio report. Sun data presented visually, textually and verbally so you know exactly how much daylight is remaining. for just £14.99 a month (UK) / $16.99 a month (US). Streamline your workflow and fly smarter for less than 50 pence a day. Download now and subscribe in-app to get access to all these features instantly. Multi-source 7 day forecasts provided hourly. Windsock stopped working and is now asking for a subscription?! Windsock 2.0 was launched end of 2013 and unfortunately as popular as it was, it made a massive loss. It used the best weather data available which sadly isn't free and every time a forecast was fetched it had a cost associated. While the original app was priced to include a casual amount of usage over the lifetime of the app version (1 year being the expected lifetime), it was a business model that sucked. The more usage Windsock got the more its costs started to spiral and so I had to regrettably remove the app from the store mid-2014. However many loyal users had paid and I didn't feel it was fair to just shut everything down after seven months even if I knew the business model wouldn't work. Therefore I kept paying the server and data costs for a full 3 more years expecting users to move onto other apps but it just didn't happen! I regularly got emails from keen users who still used Windsock every day! Unfortunately, the costs reached a point where I had to make a decision to either shut the server and app down completely or try and resurrect the business model to make it sustainable. Hence Windsock 3 is now using an in-app purchase subscription model with a host of new pro-level features. I know that is very frustrating for many of you. If it helps I kept the app version going well beyond its original 1 year lifetime, however, I hope you understand I had to make the change or kill the app completely. Windsock 3 has a host of new features and data which I hope you'll try out and I would like to thank you for supporting Windsock over the years. Subscriptions to premium weather data are £14.99 (UK), $16.99 (US) for 1 month and charged to your iTunes account at confirmation of purchase. Note there is a 1 week free trial. You can buy a subscription by downloading the latest version of the app on the App Store and then going to Windsock > Settings > Subscription. Subscriptions automatically renew unless turned off at least 24 hours before the end of the current period. Subscriptions can be managed by the user and auto-renew can be turned off by navigating to subscriptions into iTunes. Yes, when you subscribe you can trial it for 1 week. If you wish to cancel you must turn off auto-renew at least 24 hours before the end of the current period to avoid being charged. Does Windsock work in all of the USA? E.g. Hawaii and Alaska. How about Scotland? Windsock uses a wide range of data sources, which are aggregated together statistically to provide the most accurate forecast possible for a given location. Whilst developing the application, hundreds of test points all over the world were used and Windsock has been developed to give excellent readings particularly in remote locations. How accurate is the wind data? Windsock uses data from a next generation forecast service that gives high-resolution readings every hour up to 7 days in advance. This is a paid-for service that uses multiple weather services such as local weather stations, satellites and even meteorological airport forecasts and feeds them into various weather models to generate highly accurate local forecasts for locations all over the world. Which units of measurement are supported? 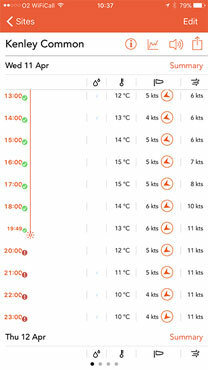 Windsock will display wind readings in kts, ft/s, mph, m/s, and kph. 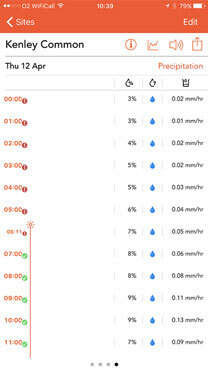 Temperature units can be displayed in degrees C and degrees F while the pressure can be displayed in hPA (millibars) and inHg. To configure this open the app to the main screen displaying all your sites. Tap on the Settings cog on the bottom left toolbar and then tap Units. You can then configure your default measurement unit. Why is there a battery warning symbol on the readings? This symbol displays in cold temperatures when Lithium Polymer batteries such as those used in GoPro cameras, RC planes and drones often have reduced performance. If this is a feature that doesn’t apply to your activity you can turn it off in the settings. To do this, open the app to the main screen displaying all your sites. Tap on the Settings cog on the bottom left toolbar and then toggle the Battery Warnings switch. Just ping me a message and we'll do our best to get back to you quickly.